My husband and I had such a great time on Saturday checking out the Guild of Bookworkers 100th Anniversary Exhibition which is on display at a local museum. 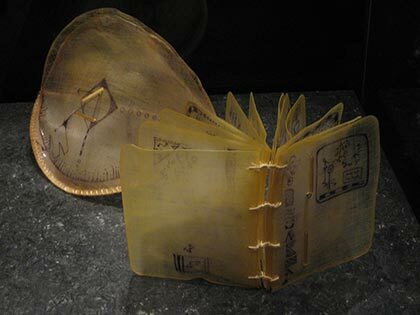 This traveling exhibition highlights the works of bookbinders and book artists. 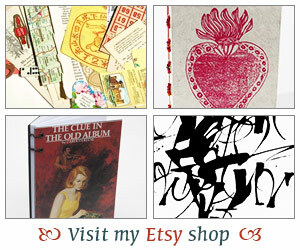 I saw books made out of fir wood, goat skin, hand-tooled leather and many other mediums. We saw pop-up books to traditional coptic bindings and even a book made out of aluminum. One book was a traditional panel binding but embroidered with each square inch taking two hours to complete. That’s a lot of patience. Some books were blank inside but many of the artists’ books were not just beautiful or intriguing objects but carried a message, whether on the importance to go out and vote to making a poem come alive by creating visuals to go with the text. You can go to this link to see all the books. It was truly a fantastic experience. I came home and ordered the exhibit’s catalog as I dreamed of one day making a book like these. Hmm, I’ve got much, much more to learn. Thanks for the link. Those were fascinating to see! That sounds like an amazing exhibit! I’m definitely looking forward to checking out the pictures. Love the link; thanks for sharing! Would have loved to see them in person, but I’m glad you had the opportunity to do so. Such beautiful work! What a beautiful exhibit! Too bad it’s not coming very close to our home, but you must have loved it!! Cool!!! I love books as art. Oh, I would LOVE to see that exhibit! And I’m having a great time looking through the retrospective exhibit photos; thanks so much for the link. Wow, thanks for the link. It must have been really wonderful to see them in person. I’m still in awe by the orginality and beauty of some of these books. Christine – Yes, it’s the exhibit at the Bridwell Library at SMU so go see it if you can. Fantastic! Does the catalog give instructions or hints on how the books were made? Isabel – No, no hints but it does have info on the artists, materials used and some background on the concept for each piece. It’s encouraging to see how books and reading are still being celebrated during this “unreaderly” time. Thank you for the link. I love reading, but I also love books as physical objects. It’s so nice to see that aspect of them being celebrated. These are amazing – thanks! Matt – It is isn’t it? Our local paper scrapped the book review editor. Thank goodness for book bloggers! Nymeth – I am also a big fan of books as art. There are some amazing things out there. Sounds like a truly wonderful exhibit, Iliana! I will have to keep my eyes peeled for something like this in Toronto. Thanks so much for including the picture…that book is awesome!